The main aim of this medium-related club trip was for everyone to be able to sip lattes, except for Sam who wanted a bottle of L&P and a steak pie. To get there, though, we first needed to negotiate Tregear Spur. Location: Tararua Forest Park, Otaki Region. People: Sam, Alistair, Sarah, Stijn, Marie, Louise, Glynne, and me. Huts visited: Field Hut (1 night), Kime Hut (0 nights). Intended route: Otaki Forks to Field Hut (Friday night), up to Kime Hut on Saturday, then down Tregear Spur (above Tregear Creek) to Tregear Creek. Walk alonk the river to Waiotauru Forks. 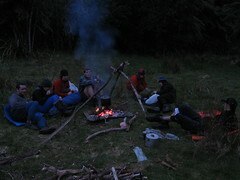 Camp somewhere on Saturday night, follow the track back to Otaki Forks, acquire van and drive to Coastlands. Buy Lattes. Items lost: One wristwatch, one large air-mattress, one walking pole, and one ring. Related bits: Stijn also wrote a trip report about this weekend. We began at the Otaki Forks’ road-end, and from there we walked up to Field Hut on Friday night. There was a bit of a race to get there, since the club also had another group starting from there the next morning. Once we arrived, though, there was easily enough space for everyone, including the other guy who was getting started on the Southern Crossing. Everyone in our group was more or less up by 6.30am on Saturday morning. The tops were clouded in but the weather was really calm, and after some breakfast and packing, we were walking by about 7.20am. I had finally figured out (more or less) how to use the $40 alti-meter watch thing that I’d bought on Trademe. I calibrated it at Field Hut, and later in the trip I was quite impressed to find out later in the trip that it seemed to be working. We reached Kime at quarter past 9 and said goodbye to the couple that was just leaving. We stayed for about half an hour, mostly examining the maps for details of the spur for which we were aiming. It wasn’t far after Kime that we were intending to leave the track. Earlier in the day there had been some thoughts of walking up Mount Hector. Despite Alistair’s attempts to convince Sam that there was a new biv on the top that might be worth checking out, we decided with the current cloud cover not to do the side-trip. The weather was still very calm, but there was a good incentive for putting on another layer now that we were a little more exposed, and the wind had a bit of a chill to it. 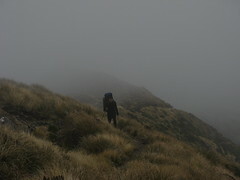 It was only a few minutes before we found the turn-off, and Sam led the way through the clouds down the spur. 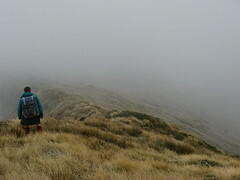 By the time we’d scrambled through the alpine fauna and made it to the bush-line, the clouds had begun to clear. There were a few spurs going off the sides that we needed to be careful not to take accidentally, although we managed after a few debates, and taking of bearings. It wasn’t immediately obvious how to get into the bush which was quite dense from the outside. Sam and Glynne scouted the edges in opposite directions until Sam found an entrance that even came with an unexpected track marker. It took four and a half hours from the bush-line to reach the river at the bottom of the spur. This included a stop for an early lunch of about half an hour, where a brew was put on. We then continued on our bearing down the spur, eventually finding an old log hauling channel that matched our bearing, making things slightly easier for a while. Later and nearer to the end of the spur, we found ourselves fighting with large amounts of tangling Supplejack and progress became more difficult. Stijn and I became separated at the back for a short while, not having seen the route that the others had found ahead. We eventually managed to get down after following voices and circum-navigating several large trees. It was some time during thi, I think, that Stijn managed to lose a sleeping mattress and a walking pole, both of which had been tied to the outside of his pack. By the time we had reached the river at the bottom and Stijn realised what had happened, nobody felt particularly motivated to wander back up the hill-side and look for them. Added to a wrist-watch that Marie had accidentally mis-placed somewhere earlier on the spur, this was turning into quite an expensive trip. Our attention now began to move towards the idea of finding a good camp-site, since from this point, it should be a fairly straightforward walk back to Otaki Forks the following day. We walked for another 1.5 hours in water that reached about waist-deep, along Tregear Creek and then the Eastern Waiotauru, eventually reaching the Waiotauru Forks, just underneath a real track. After a short re-gathering, we climbed up to the track, crossed the swing-bridge down the river, and within 30 minutes we’d found quite a nice camp-site. This was also the time that we discovered just how much excess tent fly space we had. What hadn’t been taken into account was that those who hadn’t been asked to bring flies were quite anti-social. Between us we probably had adequate shelter for at least 14 people. Glynne and Louise shared one of the large flies between them, while Stijn gathered up about several arm-loads of ferns and placed them under the other large fly, to combine as a temporary mattress under my own Huntech fly. Sarah and Alistair had bought the other Huntech fly for their own use. Sam had his one person army-camouflage fly, and Marie had her small tent. It was a great night for a camp-fire, and Sam is really good at building fires. Some previous campers had also left a load of gathered firewood in the trees, which saved us effort in searching for some of it. Sam had a stable fire going very quickly. Most of our dinner (veggies, potato mash, and a mix of steak or sausages) was cooked over the camp-fire, which was a new experience for me. I wandered back to bed before dessert as I was feeling full after a nice dinner, and I think I slept quite well on Saturday night. Sunday morning was basically a tidy-up before we got moving. As we were packing up the flies, Sarah managed to mis-place a ring, which fortunately hadn’t been a very expensive one. We spent some time looking around the camp-site, but without any luck. The remainder of the walk was along a comparatively nice track, although it was narrow in a few places and required the negotiation of some slips. 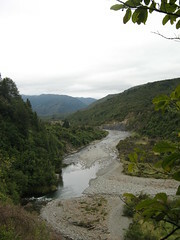 The track mostly sidles some height above the river, all the way back to Otaki Forks. We were expecting to get back to the van by mid-day at the latest, and so started eating some lunch at about 10.30am, when we reached the boiler and water wheel from an old timber mill, remaining from 1931. Sam and Alistair had a quick play with the wheel, which was still in good rotating condition, and by the time we got moving again it was raining. We reached the end of the road and the parking area at about 11.30, co-incidentally at the same time as another group from the club, which had been up to Kime and back, was also returning. After some cleaning up, we piled things into the van and got going. T’was a really good trip. 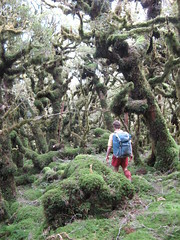 This entry was posted in tramping and tagged bagged:field hut, bagged:kime hut, navigation, tararuas, tramping, wellington tramping and mountaineering club, wtmc newsletter. Bookmark the permalink.